Travelling is exciting but what I don’t like is all the preparations I have to make before the travelling. I leave for India on Sunday. Excited that I will spend some time with my daughter. However, all these little chores that I have to get through before we travel is stressful. Clear the fridge, make sure lentils are stored away properly, must pack up all the different flours and store them in the fridge, check out the masalas, make sure no perishable stuff is left in the kitchen otherwise on my return will find a stinking kitchen! So the last few days are actually like the magic box they offer to the contestants on Masterchef. Odd ingredients have to be put together to prepare lunch or dinner. I get so tempted to buy other ingredients but actually have to stop myself. The minute Esther or Amena (our daily veggie ladies) ring the bell, I get a wee bit excited but quickly have to come back to reality. To top it up today my househelp Julius reminds me not to buy more milk or bread. And in my mind I say “yes sasu ma” 🙂 So what did I prepare with my limited ingredients? Sweet potato roll. I had some mashed sweet potato left over from the sweet potato streusel quick bread I made a few days ago. Out comes from the fridge some fresh dill. I remembered jotting down in my book a recipe to try out… sweet potato rolls. So baked some for dinner to go along with some soup. felt great as many of the veggies were used up in the soup and the rolls. Just got enough now to make lunch tomorrow. Dinner has to be some take away as officially the kitchen closes after tomorrow’s lunch. 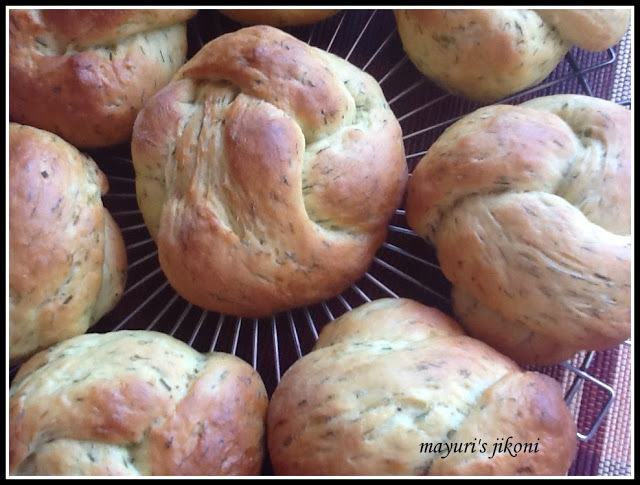 The original sweet roll recipe added some spring onions but I wanted to use up the fresh dill. I also did not add sugar as the sweetness from the potatoes is enough. Some went in the soup and the rest in the rolls. I am so glad I decided to use it in the rolls. It adds a unique refreshing taste and helps to balance out the sweetness of the sweet potato. Do you find closing the house before travelling stressful? Mix mashed sweet potato, milk and butter. Add salt, chopped dill and yeast to the flour and mix well. Add the sweet potato mixture and water and form a dough. Dust the kitchen top or board with some flour. Knead the dough on it for 10 minutes till it is smooth and elastic. If it sticks to your hand while kneading, add a bit of flour but not too much. Grease a bowl lightly with some oil. Form the dough into a ball. Rub a bit of oil over it. Put the dough into the greased bowl. Cover it with a cling film and leave it in a warm place for 1-1½ hours till it becomes double in size. Sprinkle some flour on the board or kitchen top. 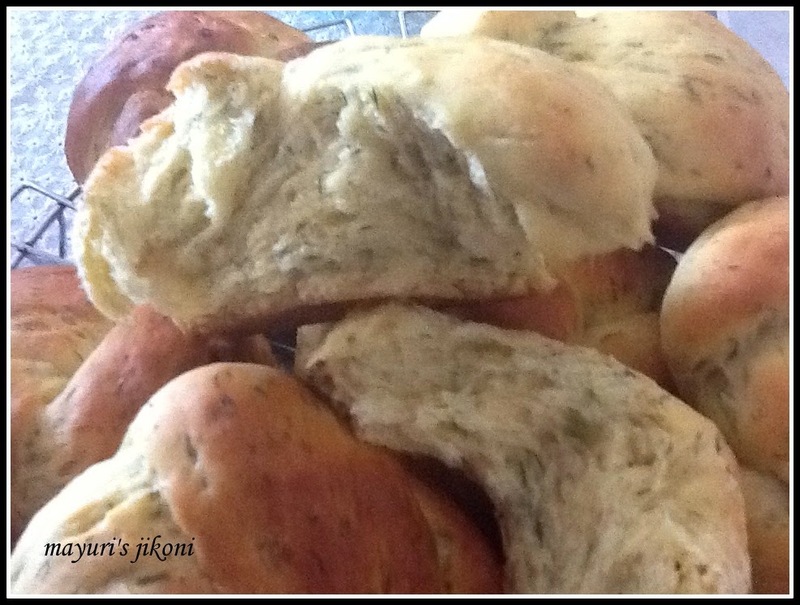 Divide the dough into 8 parts for big rolls or 12 for small ones.Roll into balls. Rest the dough parts for 5 minutes. Lightly grease a baking tray with oil. Take one part of the dough and roll it into a rope of about 9 – 10 inches long. Tie it into a knot. Tuck the ends under the knot. Place the knot on the greased tray. Repeat steps 16 to 18 with the remaining dough. Cover the tray with cling film and let the dough rise again for about 1 hour. Lightly brush the tops of the rolls with milk. Put the tray in the oven and bake the buns for 15 – 20 minutes till the tops are golden brown and on tapping the underside the roll sounds hollow. Cool the rolls on a wire rack. Boil,bake or microwave the sweet potato. If you are baking it, wrap it in a foil and then bake. Don’t mash the potato when it is hot. It will become sticky and gooey. Add any fresh herb of your choice. Shape the rolls as you like. Looks delicious with natural sweetness from potato. Looks delicious homemade bred is always best. Sweet potato rolls looks interesting. Thanks for linking. These sound so good. I never thought to use sweet potato this way. Sweet potato rolls looks wonderful and soft. I will try soon. Mayuri, have you posted “Khaman-dhokla recipe”,with besan. I always make with semolina, now i want to try the besan one.Please give me the link of your post.